Harmen has a coordinating role in organizing both internal and external projects at LIAG Architects. The scope of these projects is from design to building acceptance. In his line of work, he believes that BIM is indispensable. LIAG is known for their design and development of educational buildings and sports complexes. ”We stand for designing a sustainable and environmentally friendly building with low energy costs. We pursue a circular approach to designing and building.” explains Harmen. 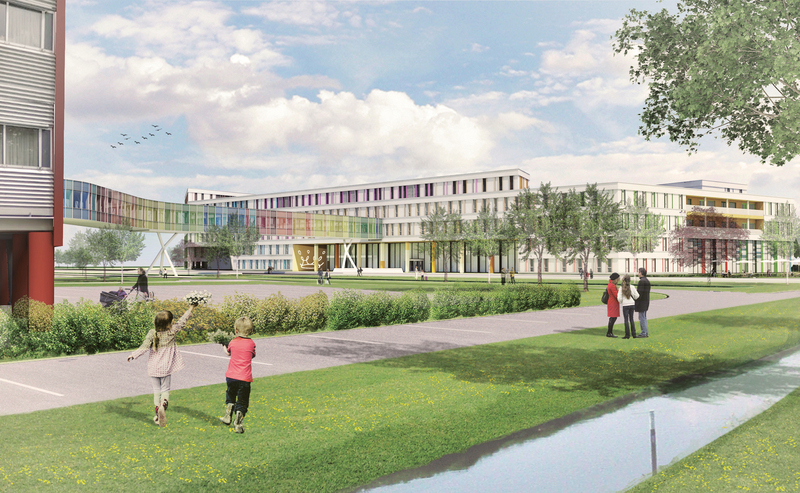 The Prinses Máxima Center for pedriatic oncology is a central place where different oncology departments, which are now spread across The Netherlands, will come together. The reason for this merge is to bundle their knowledge and innovation power to improve the chance of survival for children suffering from cancer. It is not only the development of a new building but also a new organisation. The project started in 2011 and will be finished in 2018. “Although we are known for our educational buildings, we won the tender to design this hospital due to our knowledge of designing buildings especially for children. Children need to feel comfortable in a ‘healing environment’.” says Harmen, who coordinated the design team. “The complexity and size of this building makes time pressure and remaining within budget the biggest challenges”. LIAG architects is also hired by the construction company Visser & Smit Bouw to support them with up-to-date 3D-models during the construction of this project. “We used Solibri Model Checker right from the start during the designing phase. We worked together with different design teams and partners communicating, aligning and sharing data. Getting accurate data out of the model, like for example quantities, is very easy with Solibri Model Checker.” LIAG has defined different roles which have their own specific rulesets and Information TakeOff’s; The modeller, Coordinator and Cost estimator. These roles function like a sort of template, so you immediately have the right toolset within Solibri to do your work. During the design and construction of a building, a lot of information is shared and collected. We believe that facility management will also benefit from all this collected data in the future. For example, when the building is taken into use, service parties can use this information to schedule maintenance. Especially big and complex buildings like hospitals can benefit very much from this sort of information.